“Foghat haircut,” the critic scribbled. 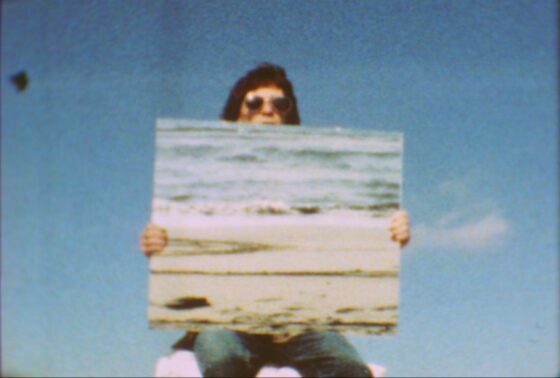 Onscreen, Gary Beydler (1944-2010), one of the greatest American experimental filmmakers of the 20th century, is seated atop what might be a tall white lifeguard’s chair, sporting jet-black aviator shades beneath a fluffy fringe of ’70s rocker locks. He holds a rectangular mirror, proportions roughly Academy ratio, propped up on his thighs, his hands at either edge. The camera filming the filmmaker is too low to depict the eastern horizon line behind Beydler, only pure blue sky filled with wisps, then billows of clouds. Reflected in the mirror in Beydler’s hands is the western horizon opposite the filmmaker, across the lapping waves of the Pacific. Clouds assemble behind the filmmaker; waves, reflected in the mirror, flood and ebb in front of him. The film is named for its hero: Mirror (1974). It’s a masterpiece, conceptually resplendent and visually dazzling—a movie that pulls in several directions at once. Mirror was produced, like Beydler’s best-known films Pasadena Freeway Stills (1974) and Hand Held Day (1975)—another landscape study for (sleight of) hand and mirror—during a brief flashpoint that lasted from 1974 to 1976. Trained as a visual artist, Beydler seems to have discovered and radically reconceptualized cinema as quickly as he gave it up. He made no more films after Venice Pier (1976). Two of his films, like many a great album cover, concentrate entirely on the filmmaker (as rock star)’s countenance: Los Ojos (1974) and Glass Face (1975). In the latter, Beydler’s face is tightly framed in close-up, sans sunglasses; intermittently, a pane of glass (which extends beyond the frame’s edges, hence preventing us from seeing it) flattens the filmmaker’s nose and other features, smushing and contorting them in cartoonish manner, thus emphasizing three-dimensionality even as it attempts to eliminate it. In the former, Beydler is again pictured in close-up, his eponymous ojos at first occluded behind those now-familiar aviator frames, just as that Foghat haircut seems to stutter familiarly in the sunlight. Again, pixillated stop-motion: Beydler’s hand enters the frame and removes the shades. His eyes are in furious motion, flitting wildly left to right. Seen against the audible paradiddles of a film projector’s mechanisms, it’s a frenetic drum solo of eyes for ears. Beydler’s head stays put, the eyes never stop dancing, and finally the shades are replaced; the curtain closes. Our heads, meanwhile, have been blown completely off.